A drugs regulator is among the first to admit that oversight of India's huge pharmaceutical industry can be patchy. G.L. Singhal, chief regulator of Haryana, a drugs manufacturing hub, says he needs double the number of inspectors if he is to properly scrutinise factories there. "We literally have skeletal services. We are struggling in the present system. Inspectors are so overburdened, and their nature of duty is very serious," Singhal told Reuters. There are just 1,500 drug inspectors responsible for more than 10,000 factories in India, where one in every 22 locally made samples was of sub-standard quality according to a study carried out two years ago. These factories supply medicines for 1.2 billion people as well as export drugs to nearly 200 countries. Indian companies produce more than 20 percent of the world's generic drugs, according to PricewaterhouseCoopers. Yet, many inspectors lack vehicles to travel to sites or sufficient space to store seized products. Moreover, former inspectors have told Reuters of lax procedures where bad practices are simply ignored. Industry and former government officials also point to policy loopholes and the lack of a single strong regulator as serious problems. Singhal's challenges in Haryana expose the weakness of oversight in a $14 billion drug industry that has already been hit by a rash of sanctions by the U.S. Food and Drug Administration (FDA) due to lapses in manufacturing processes. 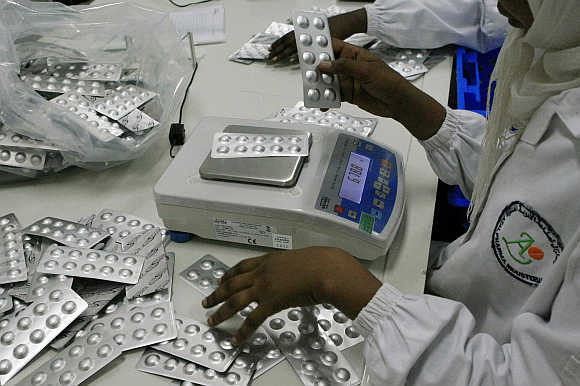 At a Ranbaxy Laboratories Ltd plant in Toansa, FDA inspectors said in January they had found that staff re-tested raw materials after they had failed analytical testing "in order to produce acceptable findings". In 2012, FDA inspectors at another Ranbaxy plant found a black fibre in a tablet that may have been a hair from an employee's arm. But the vast majority of Indian drug plants are not inspected by the FDA and are instead overseen by state and national regulators which are plagued by a shortage of staff and funds and must work through the country's slow-moving judiciary to bring enforcement actions. Of 48,082 drug samples collected by state inspectors in the year to March 2012, 4.5 percent, or 2,186, were found to be of sub-standard quality, according to a leaked confidential government document that has been published on the Internet. The document, published last year, said legal proceedings were launched in 211 of those cases. Court cases brought against local companies over drug quality take up staff time and can drag on for years, during which the manufacturers can continue to make and sell medicines, three state drug regulators told Reuters. About 40 percent of generic and over-the-counter medicines sold in the United States come from India, where they are made in over 500 plants that are subject to inspection by the FDA. The U.S. regulator, guardian of the world's most important pharmaceuticals market, has over the past year imposed import bans on plants run by Ranbaxy Laboratories, Wockhardt Ltd and Sun Pharmaceutical Industries Ltd. The remaining 10,000 plants fall under the watch of India's inspectors. Plants barred from shipping to the United States typically continue making drugs sold elsewhere, industry analysts say. Ranbaxy and Wockhardt declined to comment. The Sun Pharmaceuticals plant only made drugs for the U.S. market. "How come it is the FDA who has picked up this problem and not the Indian agency?" said Christophe Perrin, pharmaceutical coordinator with Médecins Sans Frontières, a non-profit that advocates for access to generic drugs of the sort made in India. "The Indian agency should be on top of these things." The FDA, itself, is scrambling to add staff in India to meet a requirement that overseas plants face the same level of scrutiny as those in the United States. Responding to criticism about the standard of medicines made by domestic firms, the health ministry last month issued a statement defending the regulator, saying a "robust regulatory framework" ensures high standards of quality, safety and efficacy. Under law, states regulate the manufacture, sale and distribution of drugs, while central authorities handle approvals of new drugs and clinical trials, oversee drug imports and coordinate the activities of the state regulators. "Except for the U.S., other countries have no problems with our drugs. They have never raised any objections or have found fault," said a health ministry official, requesting anonymity because he was not authorised to speak to the media. In fact, last year Britain's drug regulator imposed import curbs on two Wockhardt plants. The Drug Controller General, G.N. Singh, said the regulator tried its best to make sure drugs were regulated efficiently. "Things are moving forward," said Singh, who is responsible for granting licences to manufacture medicines. "If Haryana's regulator is telling you he is not able to regulate drugs properly, he must be right. The state governments are responsible for that, not the CDSCO (Central Drugs Standard Control Organisation)," he said. Indian companies have rushed to cash in on the rampant growth of generic pharmaceuticals in the past decade, as countries seek cheaper drugs. Many manufacturers have failed to pay sufficient attention to quality control, and regulators lack the resources to keep up, some industry officials said. "Money became the most important thing, not the quality of the product or patients' lives. Corners were cut in ways they wouldn't have been if you had a strong regulator," said former Ranbaxy executive Dinesh Thakur, who blew the whistle on production quality issues at the company in 2005. Ranbaxy paid a record U.S. fine of $500 million in 2013. Two former senior drug inspection officials, who spoke on condition of anonymity citing a fear of harassment, said a lack of resources, incentives and support from the government resulted in little action against sloppy practices. "I took salaries for 30 years without doing anything," said one, who worked with CDSCO. "I visited some of the plants ... not with the intention of taking any action, but just out of curiosity." Asked about these comments, Singh, the Drug Controller General, said: "You bring the corrupt people to my notice and I will take action. We have very honest people working for us. India is an honest country." Unlike the FDA, Indian regulators are not required to disclose inspection observations - a system that many blame for lack of transparency and little action against violators. A committee of lawmakers said in a report in 2012 that the drug regulatory system suffered from "several deficiencies and shortcomings, some systemic and several man-made". To bolster its capability, India plans to raise the number of inspectors to 5,000 in three to five years from about 1,500 now, according to Singh, the Drug Controller General of India. Thakur, the whistleblower who is now the executive chairman of a U.S.-based pharmaceutical consulting company, said bolstering regulatory oversight of the Indian pharmaceutical industry would be a lengthy process. "That has been going on for 30 years so you're not going to be able to change it overnight. It is cultural, and like all things cultural it will take some time to unwind itself," he said.